George W Bush, in between bouts of clearing scrub in Texas, must be wondering what his legacy will be. I think I have the answer. Thanks to his presidency, and the utterly lost decade he presided over, America has now reached the point where anyone - anyone - thinks they'd make a fine president. 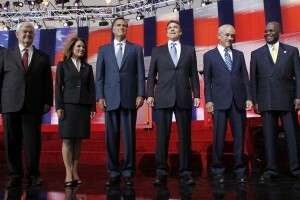 How else to explain the clown car of 2012 Republican presidential contenders currently running? These are not world class political operatives by any yard stick - most of them are not even sophisticated enough to head up a suburban Rotary Club - but they'll probably be the last to know. Why? Because, thanks to the Bush years - where bombast replaced brains and soundbites replaced strategy - people like Michele Bachmann and Herman Cain can now look in their mirrors and see what no one else does: competence. Call it the real Bush legacy. There was a time in American politics when no millionaire politician would have dreamed of blaming the unemployed for their misfortune. There was a time when an audience would have booed hearing that sentiment expressed, rather than cheered. But last night the mean minded smallness of right wing ideological extremism was on full display at the Republican debate in Las Vegas. It was a vision for the future so narrow you can sum it up in three words: I've got mine. America used to be much better than this. We used to praise ordinary workers, not insult them for lack of industry. We used to want them to succeed, not remove every social net that helped to raise them up in the first placed. We used to care about the country as well as ourselves.